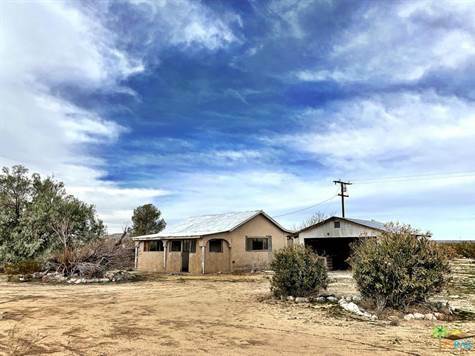 Wow fixer property in gorgeous Joshua Tree. National Park views with over an acre of usable land! Property features 2 bedrooms 2 bath layout plus detached garage, outbuilding, property connected to city water and has an old well in the backyard. It's that perfect combination of having lots of space plus easy access off the highway. Just 5 minutes to Joshua Tree Village, Indian Cove, and recreational areas. New Edison power meter installed and cleared pest report. Ready for someone to take this project to the next level and make this property amazing. This would make a wonderful vacation rental space, full time residence, and investment. Mature trees on property perfect for summer days. Square feet is estimate buyer to verify all square feet. Don't wait on this one call now!